Tony Rice has practiced his flatpicked art to great acclaim in both traditional bluegrass and innovative acoustic circle. The bluegrass sound is practically mother's milk to Tony. His father was a 'serious amateur on mandolin and guitar' and Tony cannot even recall a time when he didn't know how to play. 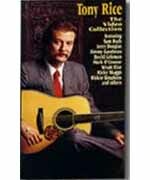 This DVD presents Tony in three different settings recorded at the 1992 Merle Watson Festival playing a wide variety of music all stamped with his personal style and sound. Tony once remarked in a Country Guitar interview, 'Others have said about me from time to time that I have a unique tone and balance on the instrument. I just kind of play it the way I hear it.' And play it he does in this exciting one-hour collection. Running time: 62 minutes.